A leaking exhaust in your vehicle is dangerous and can be a costly repair if left too long. Here are a few ways to tell if the exhaust in your vehicle is leaking. Step behind your vehicle while it is running and listen for any hissing or popping noises. These could also be accompanied by an occasional high-pitch whistle from the tailpipe. Sounds out of the ordinary are trouble, and should be brought to the mechanic's attention. One other way to easily tell if there is an issue with the exhaust system that needs to be addressed is feeling for vibrations while seated in the driver's seat. The vibration can be felt in the steering wheel, in the gas pedal, and even in the seat if you sit still while the car is in park and idling. 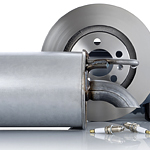 Bring the vehicle to Volvo Cars Erie for an exhaust check-up so we can identify the source of the trouble.